What is in a name? When it comes to marketing a brand or an identity the consensus is to come up with something and stick with it. Over the last few months I have been struggling with my online identity, but it has recently come to a head. Ask someone what my Last.fm profile name is, chances are three suggestions will come back. That is not how you stay brand consistent. In 2005 I registered seagurs.com and used that as my online profile, however the use of the name was very limited. Besides the website it was only used as my Gamertag on Xbox360 and, most recently, on the Playstation PSN network. Could I really be identified as ‘seagurs’ elsewhere? Would it be a more appropriate and identifiable online identity than I realized? For almost every other site or account I would go with ‘gursky’. It is an obvious nickname, usually unused when I register it on other sites. When Facebook launched vanity URL’s for user profile pages I began to wonder how I should be identified online. Would I go with ‘seagurs’, ‘gursky’ or something else? In the end I decided to go for something generic, but accurate name and claimed ‘seangursky‘. The purpose of this post, and the reason behind this whole identity crisis, began when I was looking to create my custom URL on Flickr. Instead of being identified by numbers and letters I could use a name. I have been a member of Flickr for as long as I had a domain name but never knew they released custom URL’s. I was late to the gold rush but I had the intentions of registering ‘gursky‘. However, someone with a screen name not of gursky beat me to it. What was I to do? This is Facebook all over again, do I go with ‘seagurs’ or ‘seangursky’ or something else? Ultimately I went with ‘seangursky‘ and began to wonder if I made the right choice. I can change my Flickr screen name to reflect my custom URL, but that feels like I am giving up on an identity battle, however it is confusing to have a screen name different from the custom URL. Facebook, Flickr and Last.fm all have usernames that cannot be changed; but only last.fm is without my given name and just stands as ‘gursky’. 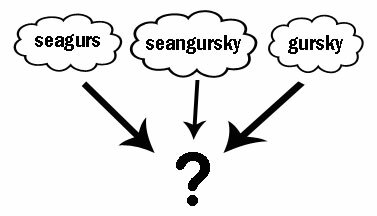 Only a few sites will allow me to change my name (like Twitter), but I guess the question is this: If the site allows it, should I move my identity over to ‘seangursky’? Or should there be a conscience split where social networking sites have one name but the rest don’t? Is it easy to define what is a social networking site and what isn’t? I am at a crossroad. No matter which direction I go there will be old left overs (Xbox 360 and PSN under ‘seagurs’ and Facebook, Flickr and Last.fm under variations of my name) but which path is the right one to take? I do not have an attachment to ‘seagurs’. It is a convenient combination of my first and last name, but is that enough to making it more prominent? Is the full name necessary? I have come to grips that I will never be the only ‘gursky’ online so perhaps this is how I can separate myself from them? But when I registered a domain name, I got GordonBird.com. The purpose of such names is to identify it as you, not to be a brand. I associate all of your monikers with you, and I’m not going to assume that you have one standing. I wouldn’t ever surf to ‘website.com/seagurs’ and expect to find you. I’d follow the link from your page. Alternatively I’d see a post written by ‘Gursky, Seagurs, SeanG’ and assume it was you. You don’t need a unified stance. My mom says names have to flow. I think seangursky may have a better rhythm than seangurs, and a smattering mix of the two when attempting to brand is actually acceptable, because they are related and would seem to work together well. I think youre all good!